I could not let this day go by without once again sharing with you a story of mine first published in our EWGS Bulletin back in December 2007. "To the Cemetary (sic) Flower Thief ........... I'm writing to tell you, whoever you are, that I don't appreciate having the planter stolen off my husband's grave every year. Also, those from other members of my family. "You are about as low as anyone can get---stealing from the dead. Don't you have any conscience at all? We who put flowers on our loved ones graves do it out of love. There is nothing else we can do for them and this is our way of saying, "I love you." Then to have some heartless thief steal them is stooping pretty low. I, and the other families whose plants you steal, don't know who you are, only that you are a selfish, mean thief who probably has a beautiful yard landscaped with our flowers, but God knows you. "Last year when I went to pick up my flowers to bring them home and plant them in my own yard as a continuing memorial to my husband, I met another lady from whom you had stolen three planters from her husband's and father's grave. She was heartbroken about it, especially for the one that one of her daughters had bought for her father. The girl had spent much more for it than she could afford but wanted it for her dearly-loved father and had planned to bring it back to him for Father's Day. You have no idea how much pain and anguish you bring to other people by your thievery and I very much doubt that you care. "One last thing I'll say to you. I hope you will think better of it and not steal our flowers this year. If you do take them, I hope they will bring you nothing but guilt and unhappiness." True story; I don't have that little note any longer but the Bulletin article included a facsimile of it. 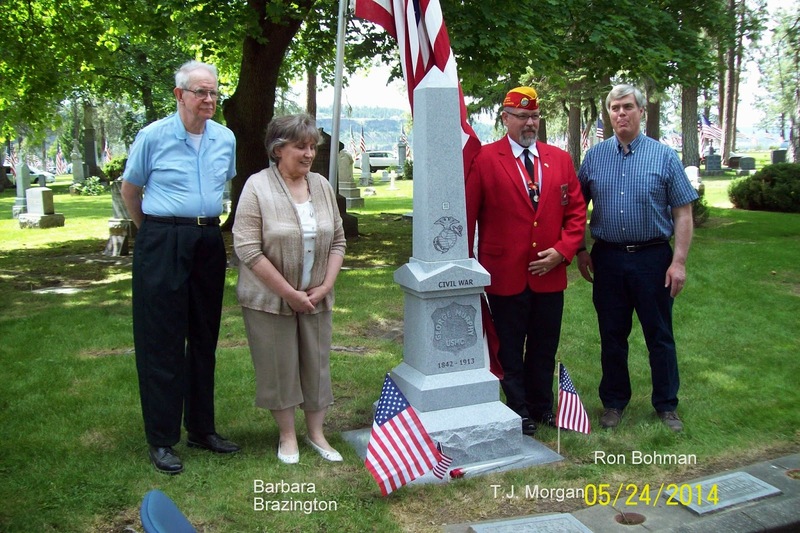 Thanks to the dedicated research and work of Barbara B., Charles Murphy is finally recognized for his service to his country as a U.S. Marine during the Civil War. 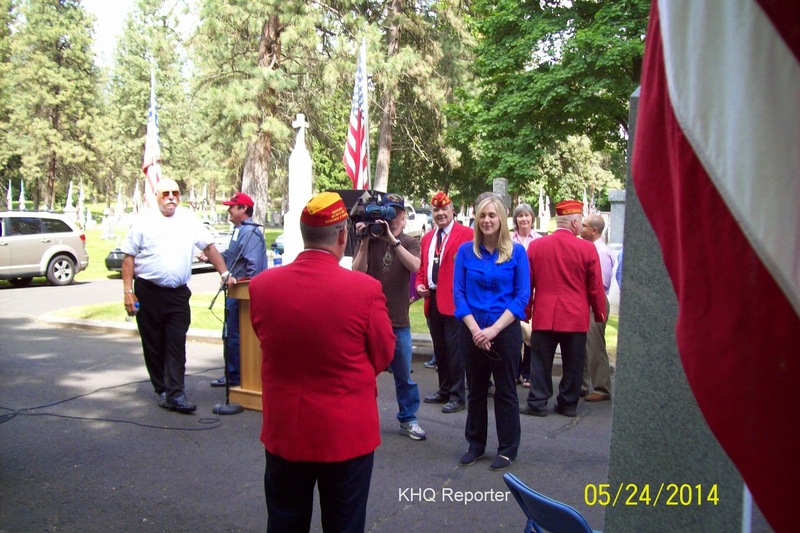 Murphy lies resting in Fairmount Memorial Park (Spokane) and on Saturday, May 24, 2014, a ceremony was held to recognize and honor him. Thanks, Barbara, for your service to uncover this story and we look forward to reading the full account of Charles Murphy and your research to find him in a future issue of our EWGS Digital Digest. 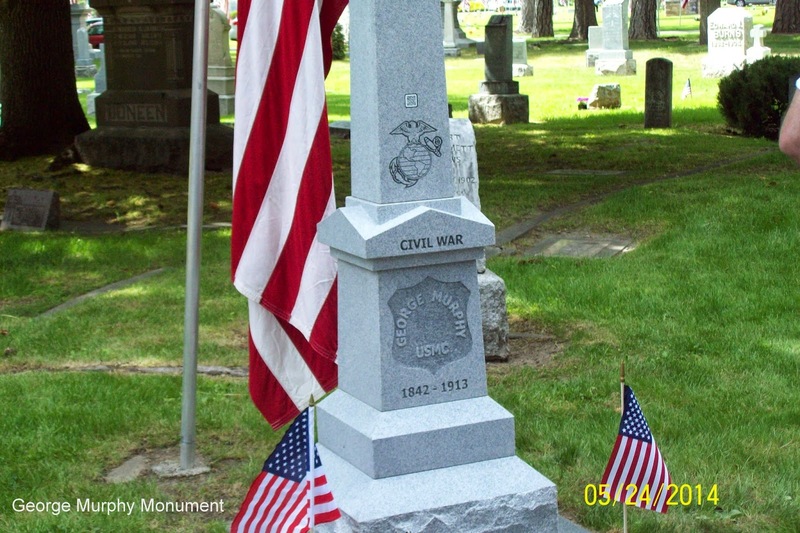 Today was the dedication of the monument for Marine George Murphy of the Civil War. If you look close you will see a small square above the eagle, if your smart phone can read this it gives the website for the biography of George Murphy. This all started about 20 years ago, John Witte did a book on the Civil War Veterans buried in Spokane County, and he tried to find information on all the veterans, but many he did not find. Fast forward to today and the internet provides much more information than was available when John did his book. EWGS wanted to put a list of Civil War veterans online and asked John for permission to use his book. 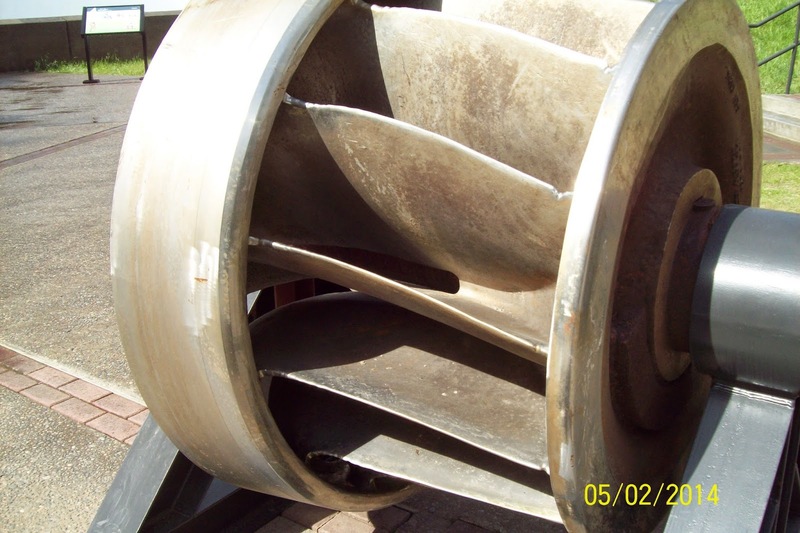 Using the internet EWGS member Barbara Brazington found information on Marine George Murphy. 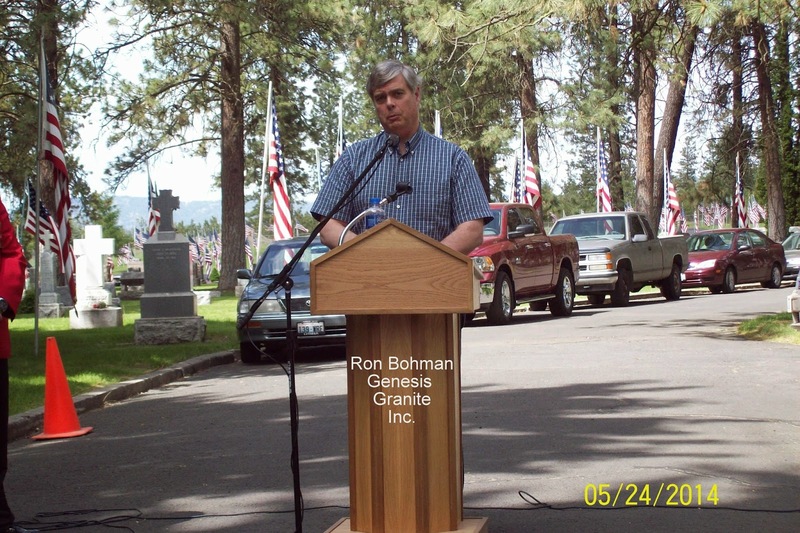 John had only found one Marine buried in Spokane and the Marine Corps League had put a monument on the first Marine's grave. The government only authorized 4000 Marines in the Civil War and they had to enlist for 4 years, so it took till 1864 to get the whole 4000. 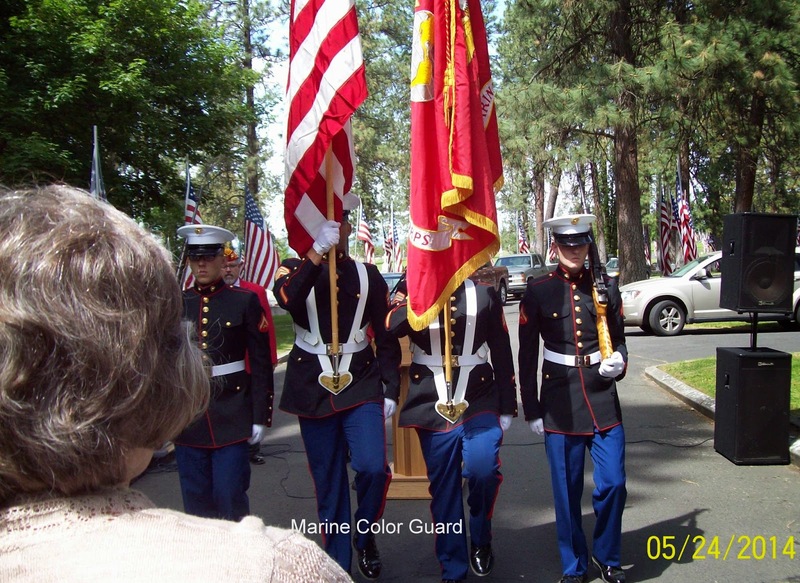 The ceremony started out with the Marine Color Guard, the National Anthum and the Marine Hymn. 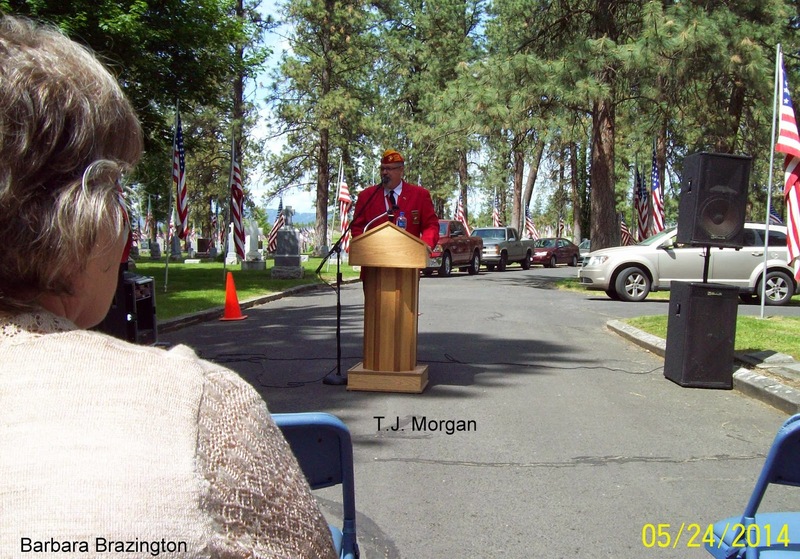 T.J.Morgan of the Marine League was the master of ceremony. 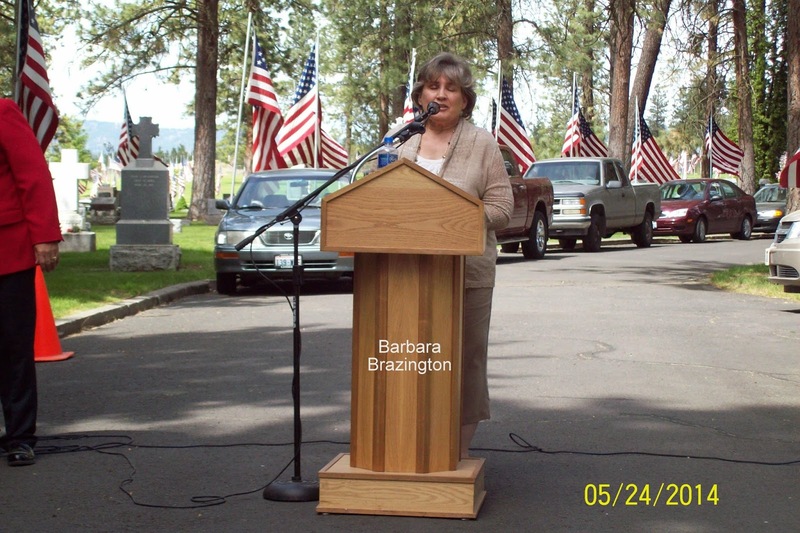 T.J. Morgan introduced Barbara Brazington and she told of the life of George Murphy. George was born in Limerick, Ireland about 1842, came to New York about 1858. He enlisted in the Marine Corps 6 February 1862 and did his basic training in Brooklyn, New York. He was then assigned to the USS Fort Henry a steam driven sidewheeled, ferryboat from New York that had been converted to a gunboat, and was ordered to the west coast of Florida as part of the blockade of the Confederate states. Here is Barbara Brazington telling the story of her George Murphy. After the war George moved to California and obtained his citizenship. George opened a stationery store in the Dalles, Oregon and returned to California to marry Isabelle Burns. They then moved to Sprague, Washington where George and his brother-in-law J.J. Burns opened a stationery and sundries store. Unfortunately that store was destroyed in the 1895 fire at Sprague, so George and Isabelle moved to Spokane, Washington. George worked as a clerk for the IXL Clothing Store, became a jailer at the county courthouse, and finally as a constable in Judge Stocker's court. George collapsed while on the job and was sent to the veterans home at Retsil, Washington where he died about a year later. His body was sent back to Spokane and he is buried in Fairmount Cemetery. His wife Isabelle (1853-1934) is buried next to him. 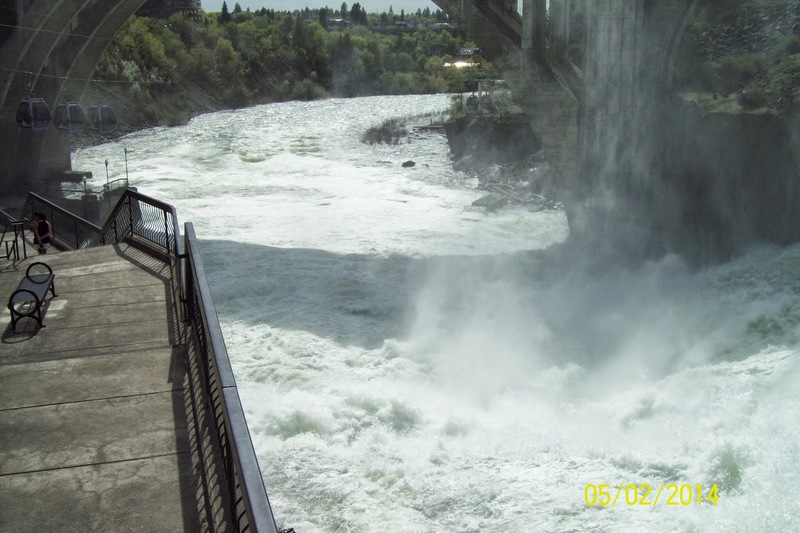 Those records from Retsil are online today at the Washington State Digital Archives. 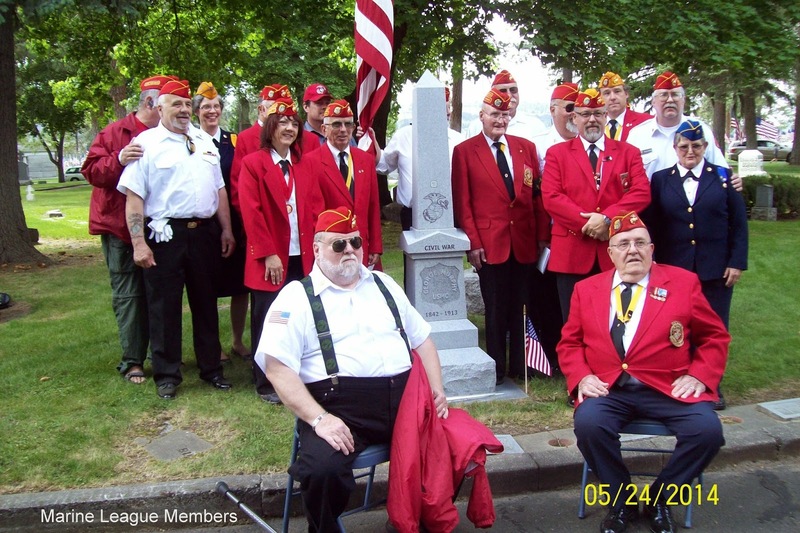 Barbara wanted to get George a military stone, but the red tape made that impossible so she contacted T.J. Morgan of the Melvin M. Smith Detachment #586 of the Marine Corps League to see if he could get a military stone. 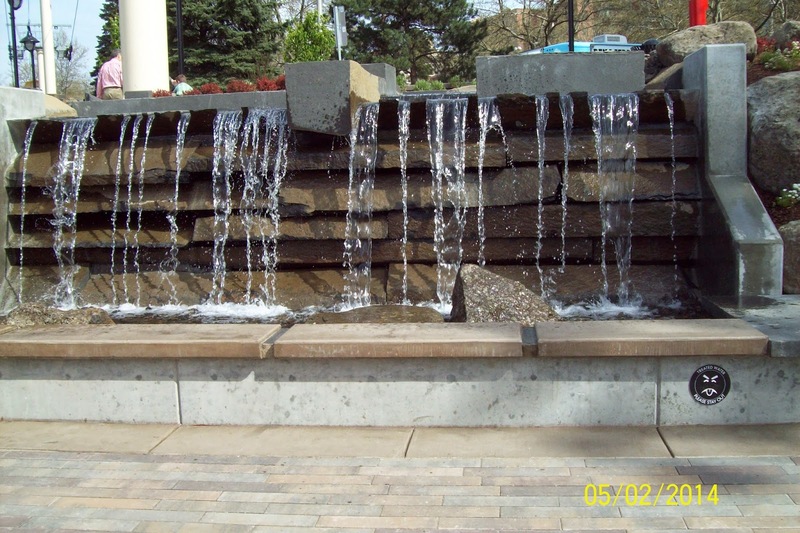 T.J. contacted several monument companies in Spokane and Ron Bohman of Genesis Granite Inc., offered to do a stone for free for George Murphy. John Witte is gentleman on the left and the three others are Barbara Brazington of EWGS, T.J. Morgan from the Marine Corps League, and Ron Bohman of Genesis Granite Inc.
Our TV station KHQ was there interviewing T.J. Morgan. Lindsey Nadrich was asking T.J. about the dedication of the stone for George Murphy. 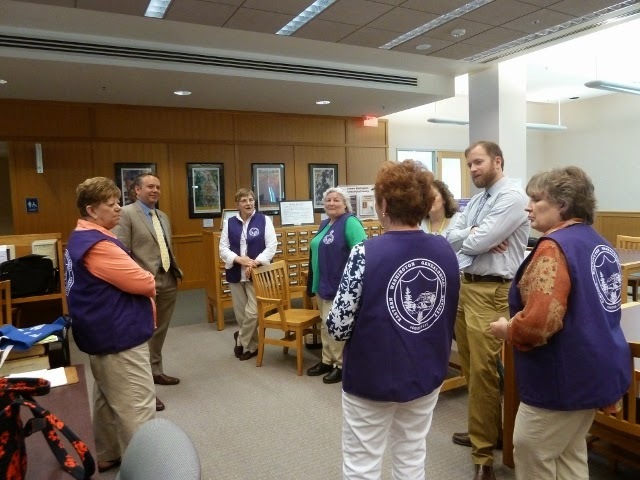 Tuesday, May 20th, was a great day for EWGS and the Spokane Public Library. 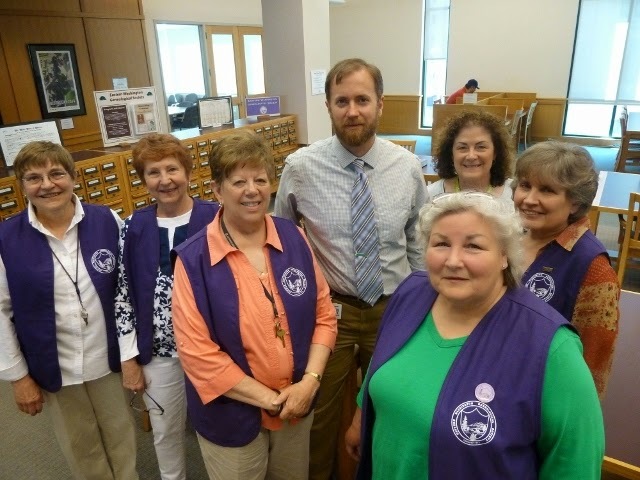 Both Library Director, Andrew Chanse, and Spokane Mayor, David Condon, visited the Genealogy Section to share ideas with the Tuesday Bunch (the EWGS Tuesday volunteers). 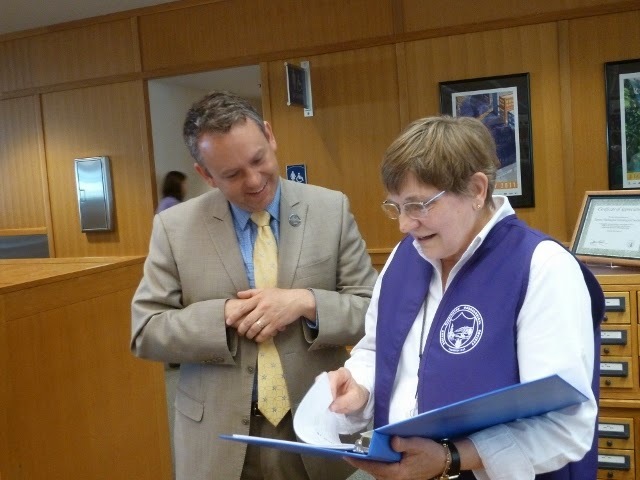 In preparation for the Mayor's visit, Mary Holcomb had compiled some information on his family history and presented him with the notebook of her findings. Some of the information was new to him and it seemed to spark his interest in learning more about his Irish heritage. You did notice that the Tuesday Gals are wearing their bright lilac EWGS vests? Need I say anything more? This was emailed to me and I have no idea of its origin. Thank you, Anonymous! Would you enjoy searching in a library of nearly 84,000 books? Would you enjoy having access to 83,947 genealogy books in your own home? For free? Of course you would. You can download these books to your desktop, laptop, Kindle, iPad or similar device. 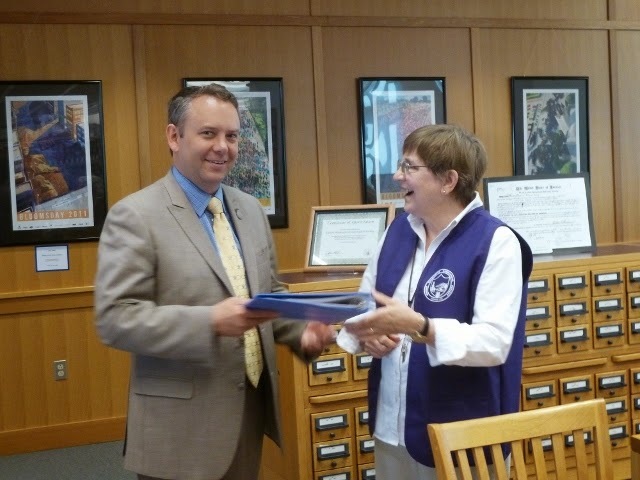 Several organizations have been digitizing old genealogy and family history books for several years and the number of these books online is growing daily. The Archive.org genealogy collection is divided into nearly twenty sub-collections. Surely there will be some free information there for YOU. Good thing to do on a lazy afternoon..............visit a gi-normous genealogy library all online. The best thing about attending a national genealogical conference is the opportunity to hear presentations about records and resources in that area. NGS 2014 in Richmond is no exception. Today, the first day, I attended two sessions on migrations into Virginia and the Scotch-Irish in the Shenandoah Valley. I am here, but what about you? How do you benefit? Some of the sessions are being streamed live; some sessions are being archived on the NGS website; and most of the sessions are being commercially taped and the CDs will be for sale. So you can benefit without being here in person. A short 72-mile drive south, Pullman has a delightful little genealogy community. They are inviting all EWGS members to join them on their 30th anniversary as a society. "Treasurers From The Attic," is the title of their celebration. 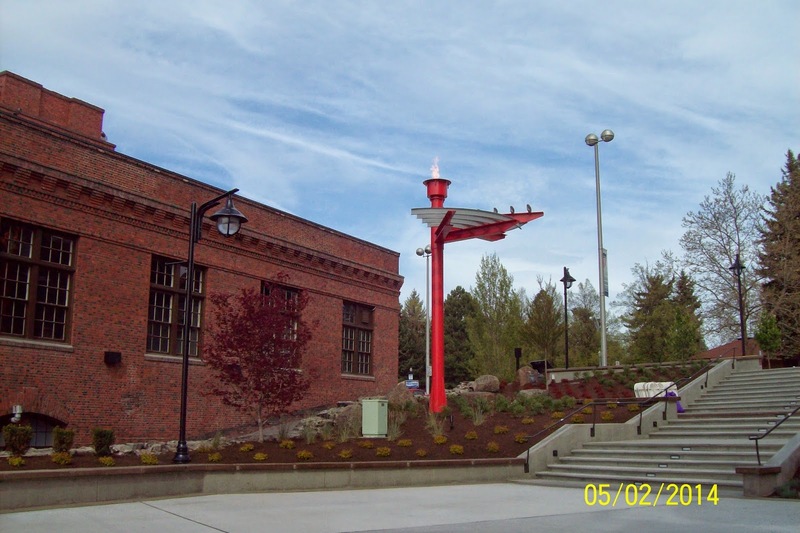 Featuring Russ Wheelhouse, owner of "Antiques by Russ," located in Moscow, Idaho, we all are invited to bring treasures from our own attic and Russ will try to figure out what it is, how much it's worth, and how you can sell it (if you want to!). They will serve complimentary anniversary desserts (at 2:30) and the program begins promptly at 3:00 on Sunday, June 8th, 2014. The place is Bishop Place Independent Living Social Room, 811 S.E. Klemgard in Pullman. This sounds like a most fun activity and one which EWGS members are invited and are honored to be invited. 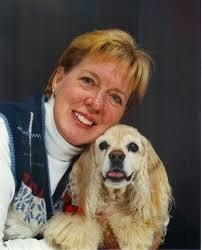 Big thanks to Margie Stein Beldin who came from Richland, Washington, to give the program at our May 3rd meeting. She did a great job of explaining the differences between the various genealogy software progreams and helped us choose the one just right for us. Thank you, Margie, for sharing your time and expertise with EWGS. 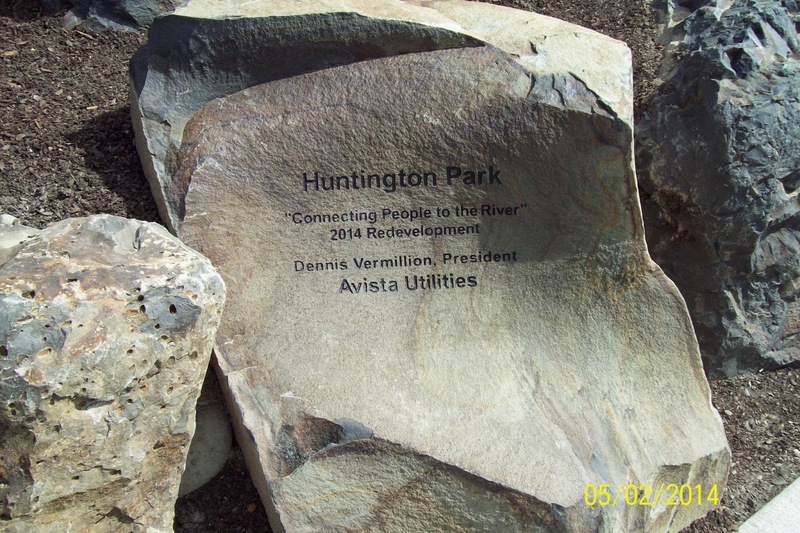 Today was the grand opening of the redeveloped Hunington Park owned by Avista (our local electric and gas utility) across the street from the downtown Spokane Public Library. 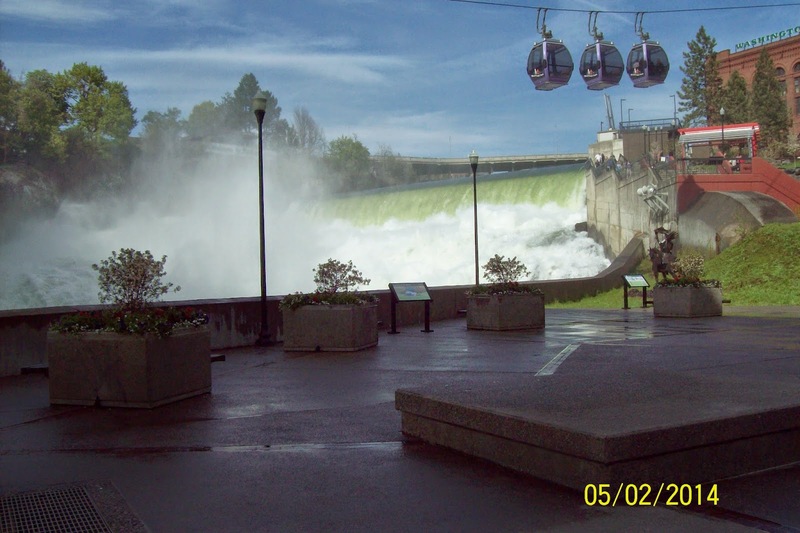 I had previously taken some pictures of Hunington Park under construction and during the spring runoff. They are here . Rock commemorating the Redevelopment of the park. Water feature where there used to be a parking lot. 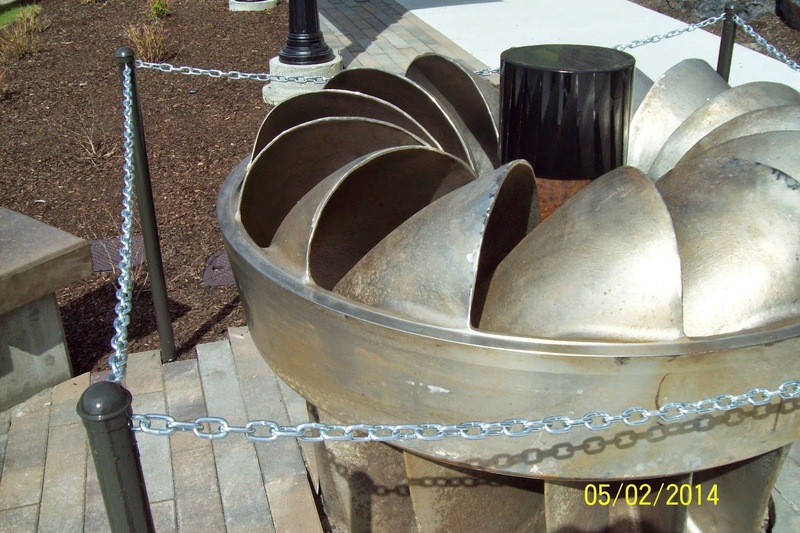 Two of the turbines from the power plant at the falls. 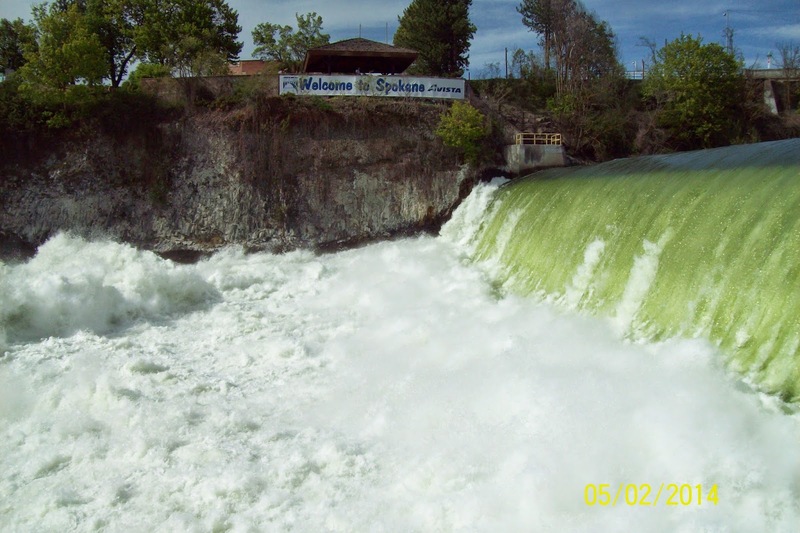 The falls with the Welcome to Spokane sign, by Avista. Looking downstream to the west under the Monroe Street Bridge. 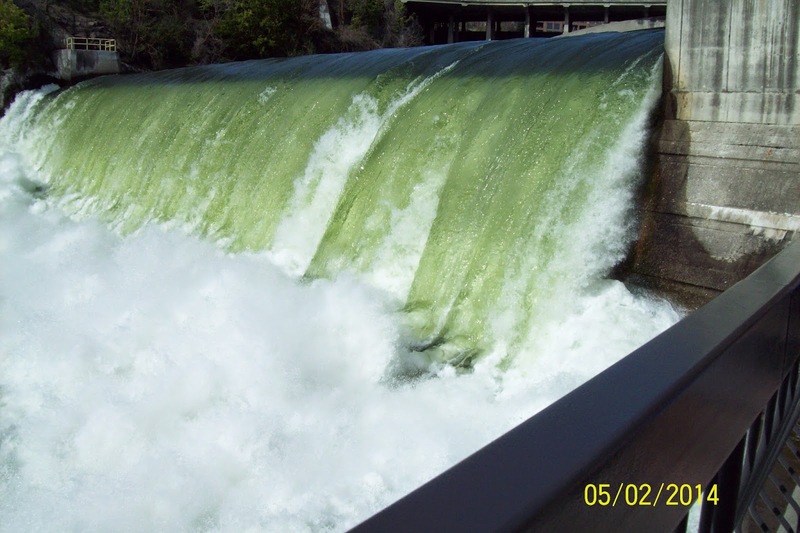 that go over the river below the falls.